The Rome food tour starts in one of Rome’s most vibrant piazzas, the Campo de’ Fiori. The farmer’s market here overflows with produce and traditional food products from the surrounding countryside. You’ll learn all about the seasonality of Italian food from the people who produce it and be introduced to a family who has run one of our favorite stands for over a century. As you try their homemade olive oil and balsamic vinegar you’ll learn their story along with what makes seasonal eating so important to Italians. The market includes a variety of tastings, and even more key facts, like the differences between cured meats; why you’re not automatically offered parmesan for every pasta in Italy; and whether mozzarella di bufala really comes forma a buffalo. After seeing where Rome’s food comes from, it’s time to see how it’s used. 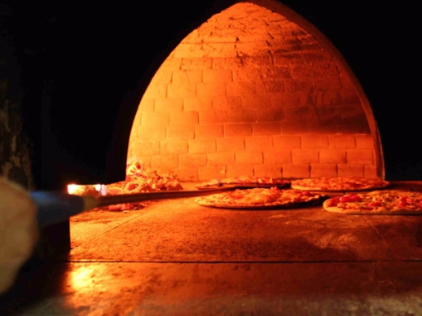 At a local pizzeria you’ll roll your own pizza using fresh, locally sourced ingredients and some of the best dough in town. Fun for both kids and adults, you’ll roll the dough, add your ingredients, and slide it into the huge, wood-burning oven. As you feast on your gourmet treat your expert foodie guide will explain some of Italy’s pizza traditions and give you an inside look at the culture that surrounds this most treasured food. After you have eaten your pizza you’ll enjoy that most Italian of treats – coffee! Take in the sights and tastes of the market in Campo de’ Fiori (one of Rome’s liveliest piazzas). Taste homemade olive oil or prosciutto crudo or parmesan and balsamic vinegar with visits to the best local specialist stores. Learn some of the secrets of Italian food like how to pick the freshest produce. Make your own pizza in a real pizzeria and learn all about the styles and traditions surrounding Italy’s most famous culinary export. Enjoy a small group of 12 people or fewer with amazing access to your passionate guide and all-inclusive food at all the stops on the tour. Cancellation policy as per Tastecapade terms and conditions. Please note that this tour requires at least 1 people to activate, in case this tour does not reach the minimum capacity 24 hours before the tour, we will inform you and offer you a full refund.